There comes a time in everyone’s life when circumstances require the need for assistance. When that day comes, we know the very best care you can receive comes from those who love you most – your family and friends. 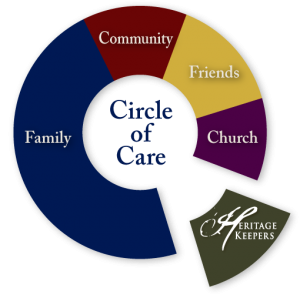 At Heritage Keepers we like to think of the support you need as a ‘Circle of Care’. Most circles will include family, friends, community and church. Sometimes, despite their desire to be there, it is impossible for your loved ones or these other groups to provide the care that you need – your ‘Circle of Care’ is broken. That’s when we want you to consider Heritage Keepers. We want to complete your ‘Circle of Care’ by providing you a variety of services in the areas of companionship, homemaking and spiritual encouragement through our family of dedicated and trained Caregivers.